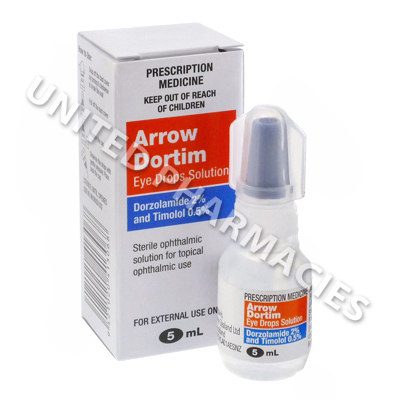 Arrow-Dortim is an eye drop used to reduce high pressure in the eye due to glaucoma or other eye condition. It contains two different active ingredients - Dorzolamide Hydrochloride (a carbonic anhydrase inhibitor) and Timolol Maleate (a topical beta-adrenergic receptor blocker). Each bottle of Arrow-Dortim contains 20mg of Dorzolamide Hydrochloride and 5mg of Timolol Maleate in a solution of sodium citrate, hydroxyethylcellulose, sodium hydroxide, mannitol, water for injection and benzalkonium chloride as a preservative. Arrow-Dortim is an eye-drop solution to be applied directly to the affected eye by the supplied dropper. One drop is usually administered into the affcted eye twice daily. Do not let the dropper come into contact with your eye. If you wear contact lenses, you will need to be remove these before applying the eye drops. Wait at least 15 minutes before re-inserting lenses. Allow at least 10 minutes between application of Arrow-Dortim and any other opthalmic treatments. Many people experience a localized burning or stinging senstaion in the eye after application. You may also notice some taste abnormalities. Other side effects that may occur but are less common include cardiovascular abnormalities, nausea, diarrhea, vomiting, abdominal pain, urinary tract infection, upper respiratory tract infection, and flu-like symptoms. Most side effects will be mild or temporary. If you think you are having an allergic reaction to Arrow-Dortim or if any of the side effects become problematic, contact your doctor. Arrow-Dortim may not be safe for use in pregnant or breast-feeding women or young children. Heart, liver or kidney problems may have increased risk while taking Arrow-Dortim. Arrow-Dortim can interact with the following medicines. Check with your doctor before using Arrow-Dortim if you are taking any of the following treatments.